Buying Netflix or Twitter could be a smart use for Alphabet's massive war chest. Alphabet (NASDAQ:GOOG) (NASDAQ:GOOGL) has lots of cash, and the business produces massive amounts of money on a recurrent basis. This could sound like the typical "nice problem to have" situation -- however, that money is not currently being used very efficiently. If management wanted to go shopping for high-growth companies in the tech sector, players such as Netflix (NASDAQ:NFLX) and Twitter (NYSE:TWTR) could be interesting candidates to consider. According to financial reports for the second quarter of 2016, Alphabet has nearly $78.46 billion in cash and equivalents plus marketable securities on its balance sheet. 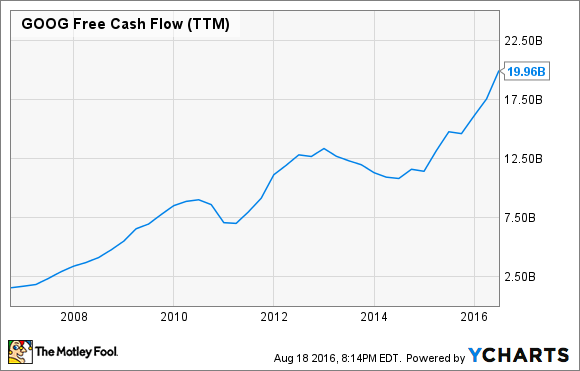 The business is also a cash-generating machine: Free cash flow over the trailing-12-month period ended in June 2016 amounted to $19.96 billion, a strong increase of 24% year over year. It makes sense to keep some cash at hand in case of a rainy day, but Alphabet is well beyond covering liquidity needs, especially since the business generates strong and growing free cash flows year after year. The company's cash hoard is mostly invested in low-risk assets such as U.S. government notes, and these kinds of securities are currently paying historically low interest rates. Since Alphabet doesn't really need to keep all that money in cash, investing in smaller companies with attractive growth potential could be a far more profitable idea. Especially when it comes to companies such as Netflix and Twitter, which have a lot to offer in terms of synergies. Netflix could be an interesting acquisition target for Alphabet, and a deal between the two companies would surely change the competitive landscape in online streaming. To begin with, Netflix has a market capitalization around $41.2 billion at current prices, meaning that Alphabet has enough financial firepower to swallow Netflix and even pay a substantial premium over current market value. Buying Netflix would allow Alphabet to make big inroads in online video, a key growth area in which Alphabet is already a top player thanks to its ubiquitous YouTube platform. Alphabet's Google launched its YouTube Red subscription service in October of last year, showing that the company is clearly interested in exploring new video monetization venues beyond advertising. Netflix ended the second quarter of 2016 with 83.2 million members globally. The company has the first-mover advantage in streaming, and a valuable library of content including both licensed and original productions. Netflix and Google together would own two of the most powerful platforms in streaming, a remarkably promising business with spectacular potential for growth over the long term. Content is a key differentiating factor in the industry, and it requires massive amounts of money. Netflix is reportedly planning to spend nearly $5 billion in programming during 2016. By joining forces with Alphabet and its deep pockets, Netflix would have access to plenty of cash to invest in this crucial area. Should Alphabet finally go after Twitter? There has been plenty of speculation on the possibility of Alphabet buying Twitter lately, and such a move would make sense from multiple points of view. Twitter stock is down by more than 30% in the last 12 months on the back of disappointing user growth over the past several quarters. The company has market capitalization around $13.4 billion at current prices, which makes it quite affordable for a tech juggernaut such as Alphabet. Twitter has 313 million monthly users as of the second quarter of 2016, and the user base expanded by a modest 3% year over year last quarter. Alphabet's Google has seven different services and applications with over 1 billion monthly users each: Google search, Gmail, Chrome, Android, Maps, YouTube, and Google Play. Integrating the two companies could do wonders for Twitter in terms of jump-starting user growth. Google is also the undisputed leader in online advertising, so there could be clear synergies from a fusion in terms of joined monetization strategies. Besides, Google has failed to make inroads in social media, as its Google Plus platform has never really gained much traction among users. Buying Twitter would give Alphabet a strong foothold in social media and access to valuable data on trending topics and consumers' behavior which Twitter has collected over the years. Capital allocation can have a considerable impact on a company and its performance for investors over the years. Alphabet's cash would arguably be much better invested in high-growth companies such as Netflix or Twitter than in fixed-income securities paying minuscule interest rates.